The Cadillac ATS is collecting a lot of accolades and acclaim from the media, to which California’s Motor Press Guild (MPG) will add their own Vehicle of the Year Award to the luxury sedan during a ceremony next week at the Los Angeles Auto Show. The MPG nod comes just two and a half months after Esquire magazine named the Caddie the Car of the Year. That one followed on the heels of the luxury vehicle being named a Best Retained Value vehicle by Edmunds.com. During the first two months of the year it was named Connected Car of the Year by Connected World magazine and Popular Mechanics picked the ATS as one of the Top Gadgets at the Consumer Electronics Show. Does this make you think a few people who should know what they are talking about really like this car? We’re getting that general idea. 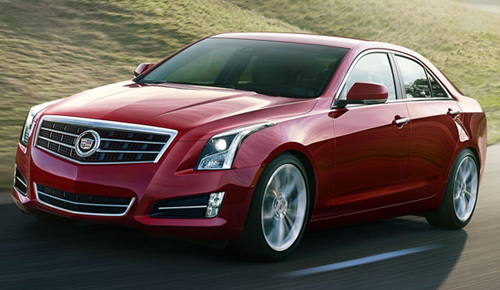 To win the MPG award the 2013 Cadillac ATS was pitted against five other finalists chosen by a select panel of MPG journalists, who regularly test and review cars. The finalists were put to a final examination by voting journalists and members during MPG's Track Day held Oct. 9-10. The Cadillac ATS went up against the 2013 Ford Fusion, 2013 Honda Accord, 2013 Nissan Altima, 2013 Scion FR-S and 2013 Subaru BRZ. It is obviously the largest and most luxurious of all the finalists. Criteria implemented during the ranking process included safety, quality and value; performance and handling; design or style, environmental friendliness and technological innovation. Another aspect the vehicles were judged by was how well they fit into the eclectic style of Southern California. Eligibility required entrants to be a new model generation or substantially changed and available at dealerships by Jan. 1, 2013. The award will be presented by MPG President Laura Burstein, on the second day of the Los Angeles Auto Show press days on Nov. 29 at 12:20 p.m.
A correction to your article. The ATS is not "obviously the largest" of the finalists listed. It's classified as a compact luxury sedan. The Fusion, Accord and Altima are all midsize sedans.